185 Days to go, 35 # to go, 1456 miles to go - All the News You Need to Know - About Ninjas! So I added up all the miles left in my training plan and realized I have 1456 miles left. Lets forget thats almost twice the number I wound up with last year, all in the next six months or so. Really, I'm trying to forget about it. I'm also trying to forget about the weekly mileage numbers approaching the number of wins the Tigers had last year (more than 80, shocking isn't it?). I think the days need to be elongated to allow my plodding self to cover that kind of distance. Thirty - forty hours per day should do. Thanks for the linkz from Running is Funny. Kudos to any blog that gives extended coverage to races that involve eating doughnuts. Also big link lovez to my sis (who also happens to be a ninja) who had a nice run in some very pleasant weather. What did I do today to make it up Hope Pass twice? Uhh I skipped my two mile speed workout. Yeah me! Seriously, have you read born to run yet? You have to read born to run. It has insider details about Leadville AND running. Two things you need to know about, me thinks. My word verification word is schpusem. Weird. HAHAHA. Man, your sister DID look like a ninja in that picture! Man, I'm a micro kind of a guy, there is no way that I could track the miles left in a plan, it would drive me bonkers! 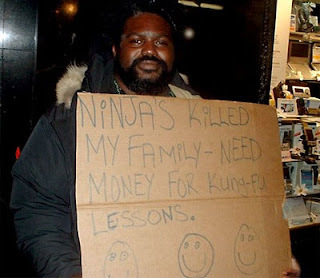 I want a Ninja mask too, your sista' is very cool. Do you think I would turn heads running in a mask in the Cali sunshine? Ha,ha. Now I really want one.